Welcome to The Hearth and Soul Hop, a blog hop for recipes using healthy ingredients, family and comfort food recipes, articles about healthy living, real, local and sustainable food, foraging, herbal remedies, organics and gardening. As much as possible, recipes should be homemade from scratch. It’s a holiday Monday in both the UK and USA today. I hope everyone is enjoying a relaxing day with family and friends. Today I’ve chosen to feature some of the tasty treats that were shared with last week’s hop. Right, on with the hop! Please link a post that closely fits The Hearth and Soul Mission. Please include a link back to one of the host sites through worded link or a badge. Please link directly to your post, not to your home page. By linking to the hop you are giving permission to feature your properly credited posts and photographs here on The 21st Century Housewife as well as on social media. Every post is pinned by at least one of the Hearth and Soul hop hosts. and me, April of The 21st Century Housewife. 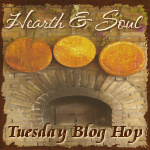 We would love it if you would please share the Hearth and Soul Hop badge to help promote the hop. Don’t miss out! Subscribe to my weekly email newsletter to keep up with all the latest here on The 21st Century Housewife. Sign up in the box above the comments. It’s a pleasure, Joy 🙂 Thank you for visiting! Hope you are having a nice Memorial Day, April. I had to work earlier, but we’re about to enjoy some of Miz Helen’s slow cooker ribs! And a zucchini casserole from another blogging friend. The blogging community keeps me well-fed! It really is wonderful all the delicious recipes we have access to Michelle 🙂 We had a lovely Memorial Day, thank you. I hope you enjoyed your holiday Monday too! Your treat’s look like they would be a great hit for the holiday. Hope you have a great week and thanks so much for the party! Thanks for the feature. What fun it would be to make all the delicious treats. My pleasure, Chaya. It would be fun to make them – I am looking forward to getting back in the kitchen soon! Thank you April for hosting, hope you have a fabulous week. Thank you, Dina. Hope your week is wonderful too! I’m curious to know what holiday you were celebrating in the UK. What was it? And have a great week-end! Hi Mireya, The last weekend in May is what we call a Bank Holiday in England – we have about four bank holidays each year that don’t actually celebrate anything, they are just a long weekend with a holiday Monday 🙂 Hope you had a lovely weekend too!